Weekend visitors to Point Reyes National Seashore in Marin County, California, have a treat in store for them. Through the end of this month, the exhibition of paintings by the Baywood Artists is on display at the Red Barn Classroom near the Visitor Center. Over 50 paintings of tule elk, pelicans, horseback riders, surf, fog, and the water and land of Point Reyes illustrate some iconic—and not so iconic—scenes. The show is a benefit for the Point Reyes National Seashore Association, the primary nonprofit park partner organization created to raise awareness and funds for education, preservation, and resource protection of the National Seashore. 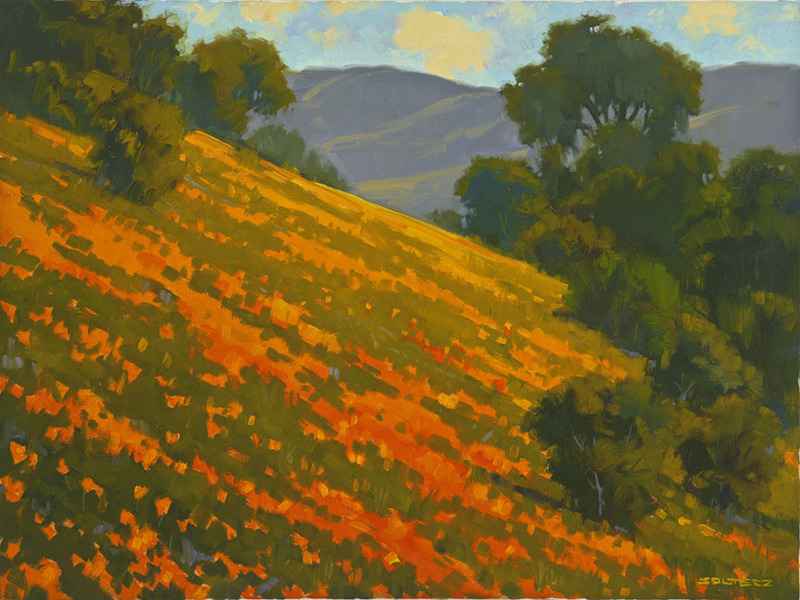 Point Reyes Poppies by Tim Soltesz. Oil. 18 x 24. At Point Reyes Wild. The show is a treat. From Tim Soltesz’ largish painting of fog rolling in to Christin Coy’s teeny views of the marshes, the works showcase the many aspects of Point Reyes. While most of the works are oils, some are other media: watercolor, pastels, graphite. Something for every taste and price range. And, even better, I hear the show is selling fairly well—nice to hear, because the sales benefit not only the artists but the land. It’s this choice to use their artwork to support conservation efforts that so impresses me with Baywood Artists. Well, that and the high quality of their artwork! For three years running they have chosen the Seashore as their focus. You can see from the images that they spent a lot of time at Point Reyes painting. Some of the works are from a mountain summit, which means the artists lugged their easels and paints and canvas up some trail to get those images! It’s a dirty job, I know, but someone’s gotta do it, right? All the better for us, the viewers, and the lucky people who take those paintings home. Point Reyes Wild is on display weekends only through the end of September 2014 from noon to 5:00 p.m.